NF-κB (nuclear factor kappa-light-chain-enhancer of activated B cells) is a protein complex that controls the transcription of genes involved in cytokine production, cellular adhesion, inflammation and apoptosis. NF-κB is found in almost all animal cell types and is involved in cellular responses to stimuli such as stress, cytokines, free radicals, ultraviolet irradiation, oxidized LDL, and bacterial or viral antigens. These transcription factors are related through an N-terminal, 300 amino acid, DNA binding/dimerization domain, called the Rel homology domain (RHD), through which they can form homodimers and heterodimers that bind to 9-10 base pair DNA sites, known as kB sites, in the promoters and enhancer regions of genes, thereby modulating gene expression. p50 and p52 do not contain C-terminal TADs; therefore, p50 and p52 homodimers repress transcription unless they are bound to a protein containing a TAD, such as RelA, c-Rel or RelB or Bcl-3 (a related transcriptional co-activator). RelA, c-Rel and RelB contain C-terminal transcriptional activation domains (TADs), which enable them to activate target gene expression. NFkB is not synthesized de novo; therefore its transcriptional activity is silenced by interactions with inhibitory IkB proteins present in the cytoplasm. which are characterized by the presence of ankyrin repeats. Among the molecules induced by NF-kB are cytokines, chemokines, effector molecules of immunity and pro-survival factors. The pro-survival effects of NF-kB can counter otherwise apoptotic signals coming from cytokine receptors such as TNF receptor I, which we discuss later, and can also protect stressed cells (this can be a factor limiting the effectiveness of cancer chemotherapeutic agents). Mutations that inactivate NF-kB are generally lethal because of the essential role of this protein in cell survival. Partial loss of function causes varying degrees of immunodeficiency: humans with such mutations have variable levels of immunodeficiency and many show poor inflammatory responses and lack some types of antibodies. These symptoms reflect the roles of NF-kB in innate immunity to bacteria (presumably via TLRs), inflammatory gene expression and B cell antigen receptor signaling. 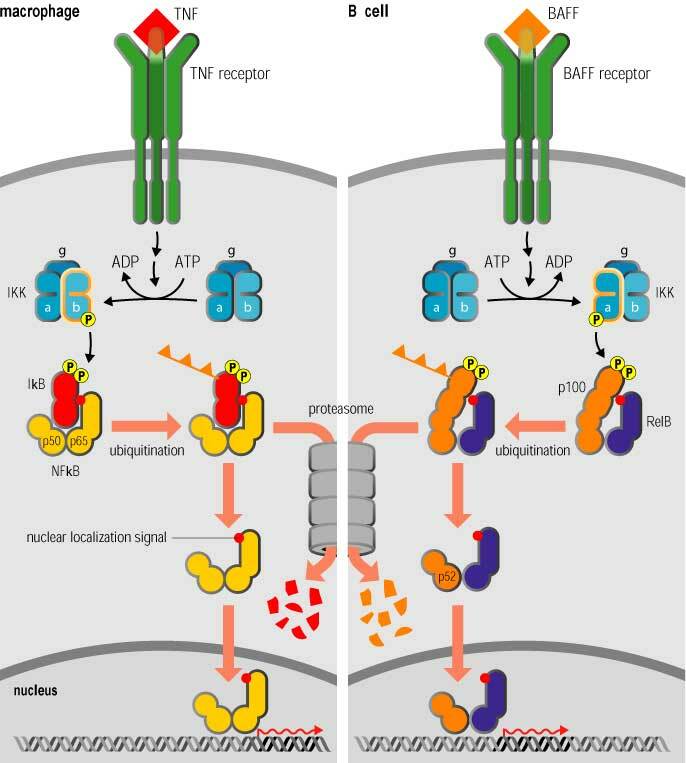 , which we discuss next, as well as in the diverse responses to other signals operating through the TNF receptor superfamily. It is also essential for responses to signaling through the variable antigen receptors of lymphocytes, which we describe later in the book. We shall see later in this section that although the protein is always called NF-kB, it is a group of related homodimeric and heterodimeric transcription factors that are likely to activate distinct sets of target genes. Homocysteine stimulates nuclear factor kappaB activity and monocyte chemoattractant protein-1 expression in vascular smooth-muscle cells: a possible role for protein kinase C.
Biochem Biophys Res Commun. 2003 Oct 24;310(3):720-4. Chen D, Li Z, Yang Q, Zhang J, Zhai Z, Shu HB. Receptor-interacting protein (RIP) is a serine/threonine protein kinase that is critically involved in tumor necrosis factor receptor-1 (TNF-R1)-induced NF-kappaB activation. In a yeast two-hybrid screening for potential RIP-interacting proteins, we identified a novel protein designated as NKAP. Although NKAP interacts with RIP in yeast, NKAP does not interact with RIP in mammalian cells in co-immunoprecipitation experiments. When overexpressed in 293 cells, NKAP activated NF-kappaB in a dose-dependent manner. Moreover, down-regulation of NKAP by antisense RNA significantly inhibited TNF- and IL-1-induced NF-kappaB activation. Immunofluorescent staining indicated that NKAP was localized in the nucleus. Our findings suggest that NKAP is a novel nuclear regulator of TNF- and IL-1-induced NF-kappaB activation. Activation of NF-κB results in nuclear translocation and can proceed either through classical/canonical or alternative/noncanonical and hybrid pathways. In its resting state, NF-κB is located in the cytosol bound to IκB proteins, including IκBα, IκBβ, IκBε and IκBζ, which inactivate the NF-κB subunits. The activation of Iκκβ leads to the phosphorylation of IκB proteins which results in ubiquitination and eventual degradation by the proteosome. 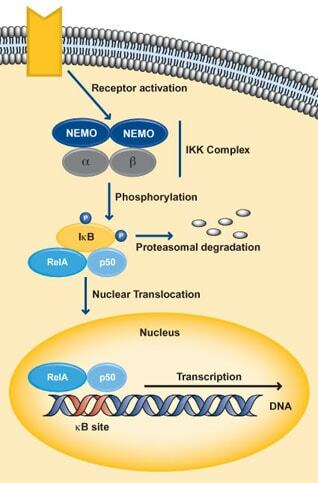 p50-RelA heterodimers translocate to the nucleus where it leads to up-regulated transcription of a variety of target genes.